This Saturday, April 6th, at Home Depot, your kids ages 5 - 12 can participate in a FREE hands-on workshop. The workshop takes places between 9:00 a.m. – 12:00 p.m and you will need to register here. All kids get to keep their bird feeder craft and receive a FREE Kids Workshop Apron, pin and certificate. Paint will be provided at the workshop for children to personalize their bird feeder craft! Back in January, I wrote about 5 Easy Bird Feeder Crafts for Preschoolers & Big Kids and I've been wanting to try out a new bird feeder craft with my son. 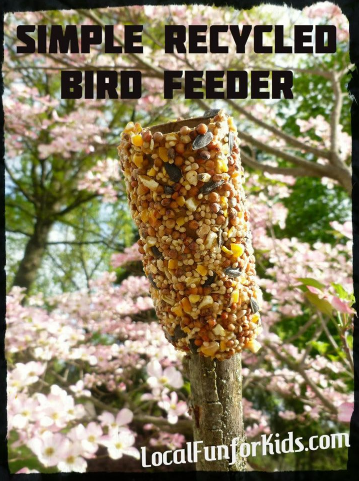 This morning we made an easy bird feeder from a recycled toilet paper tube, peanut butter and bird seed. Just take an empty cardboard toilet paper tube. Spread on some peanut butter. Cover it in bird seed. Easy as 1,2,3! You don't need any string because you just slip it on a branch and let the birds enjoy. 1) It's very earth friendly, which is perfect since we're celebrating Earth Day this week. 2) My son is 4 and only needed minimal assistance with this project. He was excited to spread on the peanut butter, cover it in bird seed and in less than 5 minutes the whole project was complete! 3) If you're in a classroom setting, this would be a fun and inexpensive project to do with a group of kids. I would recommend doing it outside, if possible, because the birdseed can get a bit messy. But, overall, it's a quick and simple spring craft.